An impressive sampler composed of numerous floral images based on Berlin pattern books. A large spray of pink cabbage roses draws immediate attention to the eye. The outer edges bound in pink sik. Framed Size 39 x 22 ins. Elizabeth Squire, York School. 1801. 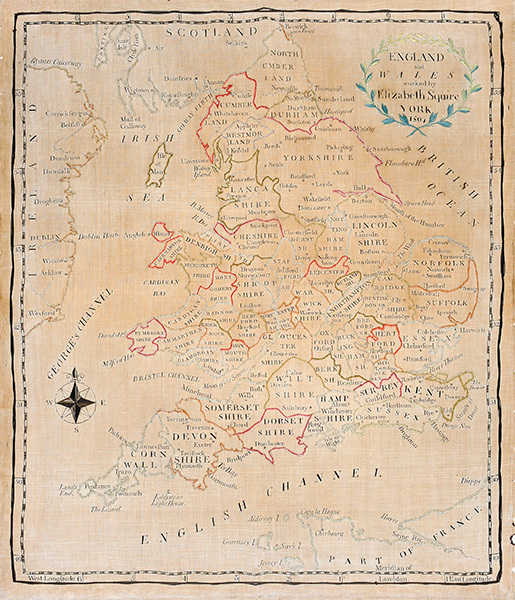 Elizabeth embroidered her detailed Map of England and Wales in 1801 whilst a pupil at the Quaker School in Trinity Lane, York. This school opened in 1785 and later was known as York School and finally to this day as The Mount School. The Mount School have in their archives similar finely worked map and darning samplers. 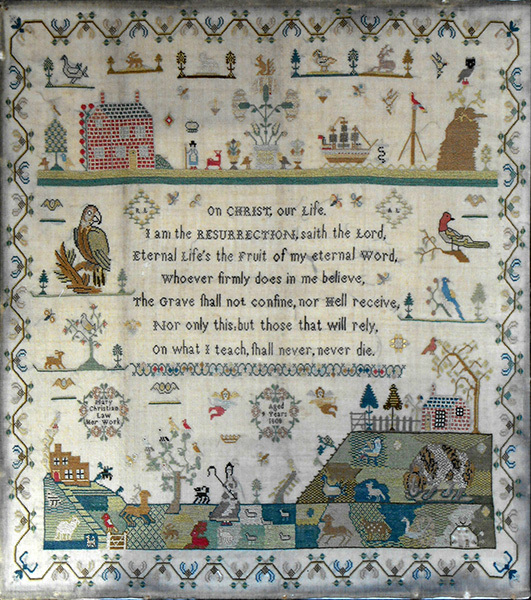 Templates for this map were commercially available and another example by Mary Peacock 1802 and clearly worked from the same template, is illustrated in 'Quaker School Girl Samplers from Ackworth', Page 62, Carol Humphrey. Contained in a finely reeded ebonised period frame. 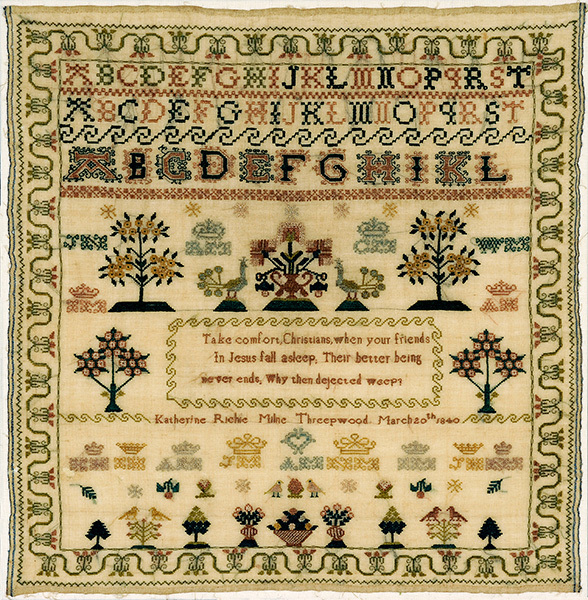 This neatly worked sampler bears the name Threepwood, which is small town in Galashiels, Selkirkshire on the Scottish Borders. Evidence of it's Scottish origin is clearly seen in the typical style of the large alphabetical letters A - L on the third row of alphabets. Family initials in this case placed below crowns are again found on Scottish samplers. Worked with coloured silks on finely woven wool. 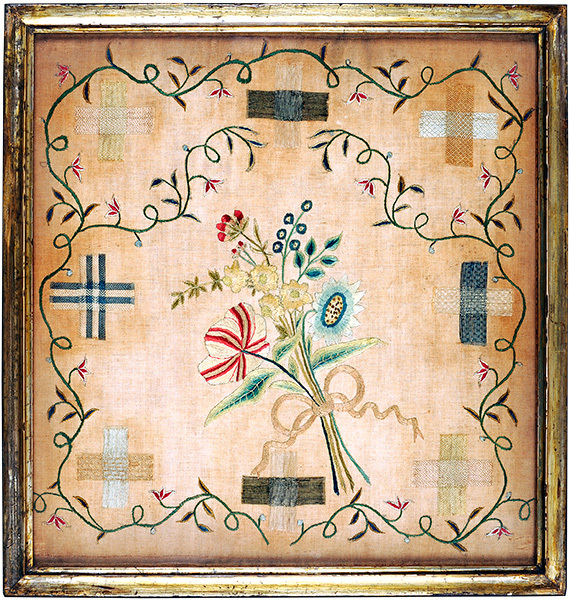 A charming sampler worked with coloured silks consisting of numerous individual small motifs surrounding a central verse within an inverted honey suckle border. The base consisting of a country scene with a shepherdess, her flock, farm buildings, assorted animals all placed on a distinctive green chequered ground. Contained in the original maple frame. 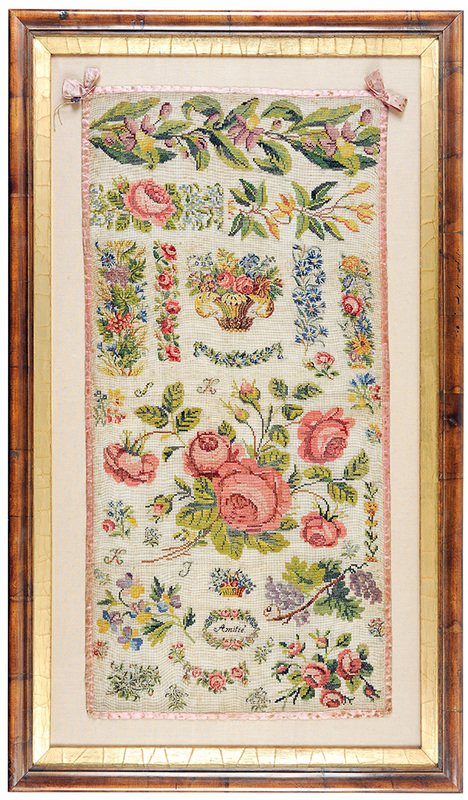 A delicately worked colourful darning sampler consisting of a central floral bouquet tied with a knotted ribbon, trailing leafy border and eight darning exercises all displaying individual patterns. Worked on a very fine gauze ground. Contained in the original gilt frame. 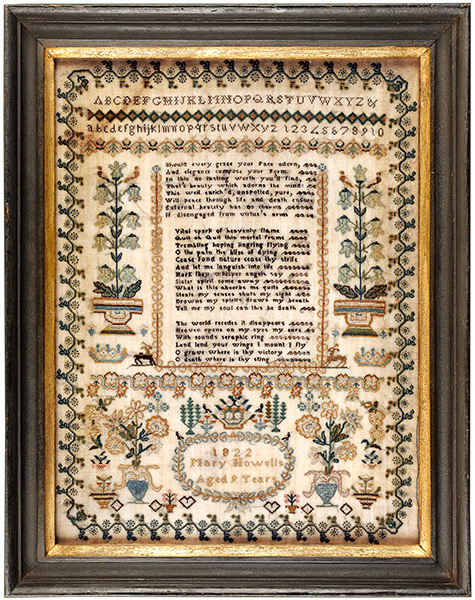 This sampler typically dates from the mid 18th century when female literacy was becoming more important. Eleven lines of moral instruction for children form the text above two angels holding 'the crown of life'. Contained in a period ebonised and gilt wood frame. 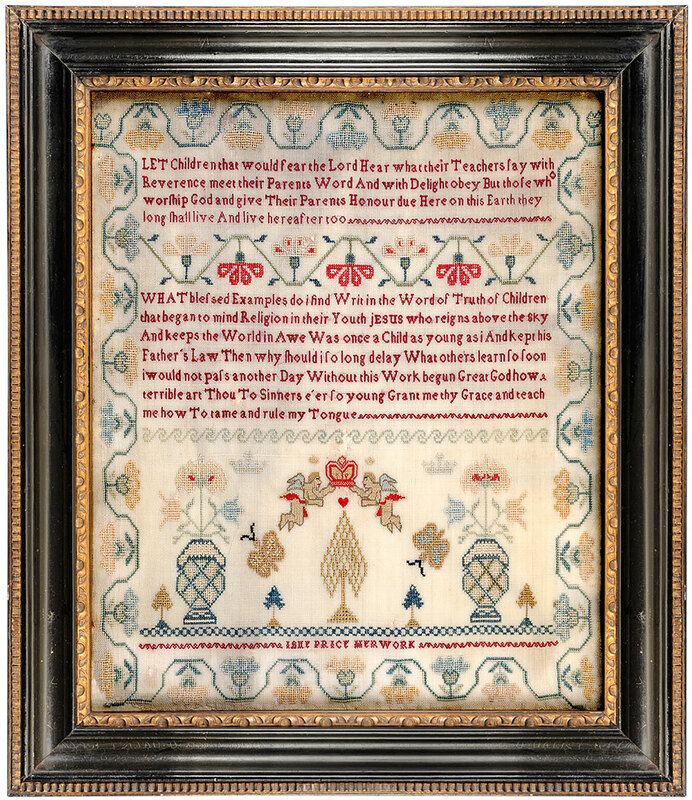 This very detailed tightly embroidered sampler is a huge achievement for a young girl of just nine years old. Worked with coloured silks on a fine ground fabric. 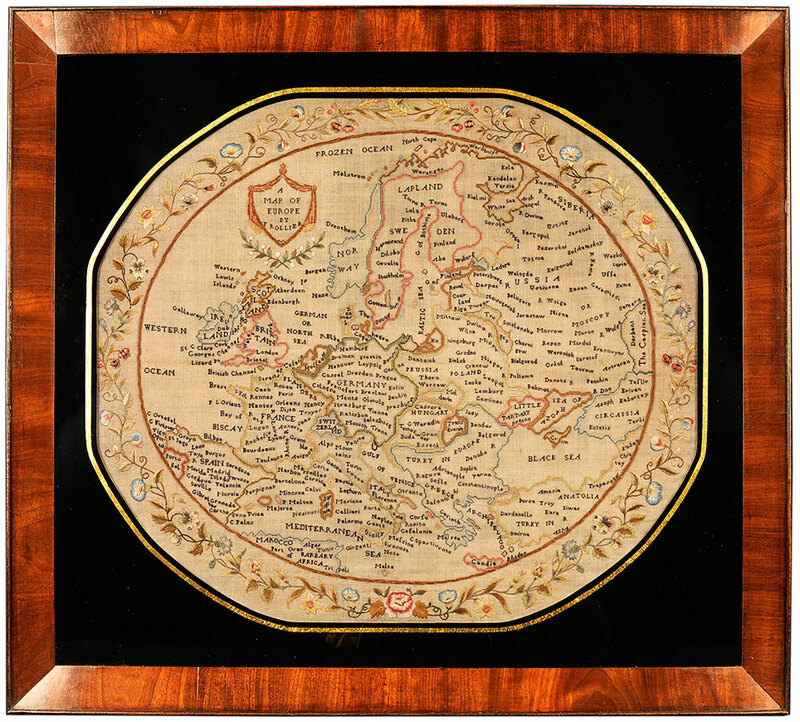 Embroidered maps of Europe are less common than those of England and Wales. This large map by F Rollier was probably traced by hand in the school-room and in common with many other embroidered map samplers is surrounded by a wide border of entwined mixed blooms. Coloured silks and chenille on a satin weave silk ground. Broad mahogany frame and mount.